Ever wanted a development kit that flies? Well now you can have one! 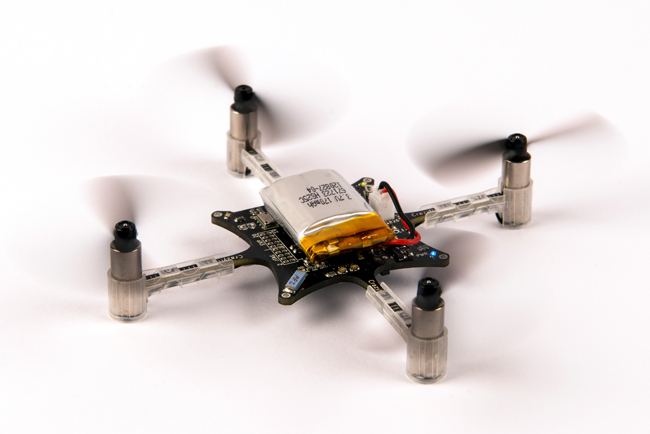 The Crazyflie is an open source nano quadcopter kit designed for flexible development and hacking. It's among the smallest in the world, weighing only 19 grams (0.67 oz) and measuring 9 cm (3.54 inches) motor to motor. The development platform is open source so schematics and firmware/host source code is available at the Bitcraze website as well as a Wiki with design information and details on how to set up the development environment and get started. It’s designed with development in mind and has an expansion header that enables developers to expand the platform as well as good software development support. Due to it’s small size, it is perfect for developing new software and can easily be flown inside (please be careful, the propellers spin very fast). It can lift a payload of up to 5-10g. This is the 10 DOF version of Crazyflie that integrate extra sensors for altitude and heading measurement. There is not yet firmware support for these sensors but they have the potential to enable heading and altitude control. If you want to develop a new algorithm or if you want to be able to use some advanced algorithm that might be created for these sensor you should definitely consider the 10-DOF version. A 2.4GHz radio chip from Nordic Semiconductors is used for receiving commands and sending telemetry data back to the host computer. The communication with the host is made possible by using the Crazyradio 2.4GHz USB radio dongle (included with this kit). The Crazyradio can be connected to a PC (with support for Windows and Linux) but also to other hosts that support USB Host or OTG like Android phones. Mac OSX support is currently in beta, and the support is handled by the community. The Crazyflie Quadcopter is shipped pre-programmed and can easily be wirelessly updated via a radio bootloader from a host PC, so no JTAG is required for reprogramming. For advanced development and debugging there’s also an accessible JTAG interface. This kit requires soldering skills and is not for beginners. It is not a toy and should be handled with care. Expansion header 2×10 pins 1.27mm (0.05”) pitch including power, I2C/UART, SPI/ADC. Header also contains ARM Cortex 10-pin JTAG. 1 x 2*5 pins 1.27mm (0.05”) pitch header. Each part of the Crazyflie Nano Quadcopter Kit is tested before it leaves the factory, but please keep in mind that the kit is still experimental, unproven hardware. This hardware is distributed in the hope that it will be useful, but WITHOUT ANY WARRANTY; without even the implied warranty of MERCHANTABILITY or FITNESS FOR A PARTICULAR PURPOSE.